The next 5 th of April an exhibition at the Estorick Colletion will present a precious selection of 116 (out of 300 artworks of the entire collection), of the most popular and significant masterpieces by Giacomo Balla (1871-1958) gathered by the fashion designer Laura Biagiotti and Gianni Cigna during their intense and passionate years of art collection. The exhibition is cured by Fabio Benzi, the Scientific Director of the Biagiotti Cigna Foundation, and is Giacomo Balla’s first collection to be exposed in this century in London. It illustrates Balla’s entire artistic career in a selection of 36 paintings on oil, tempera and pastels including highly representative operas as, Autospalla (1903), Inverno (1905) La siepe di Villa Borghese and Donna a Villa Borghese (1906), the portraits Egle Casarini and of Grethel Löwenstein (1911), masterpieces of the divisionist art; the portrait of Tolstoij of 1911, significant art work for the transition of prefuturism and futurism; the two important artwoks Compenetrazioni iridescenti (1913) and Vortice + Paesaggio (1913), a unique example of the rare abstract speed which is one of his most famous subjects, illustrating his very first futurist period. 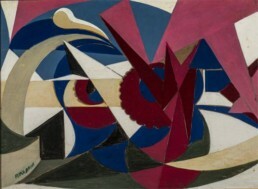 ; Linee di forza di paesaggio maiolicato (1917-18), artwork showing the return of the ballian futurism to synthetism, exposed in the House of art of Bragaglia in 1918, Paesaggio di Villa Borghese (1918), Espansione di Primavera (1918), Una passione (1920), Dinamismo atmosferico (1922-25 c.), Futurpesci (1924) e Vaprofumo (1926), all relevant and original creations of Balla’s mature futurism. Lastly we may admire a magnificent series of paintings relating to the return of figuration, as in Nel patio (1926), Parlano (1934), Autoritratto (Autobalsettanta), 1946). An important section is dedicated to Balla’s studies on fashion. 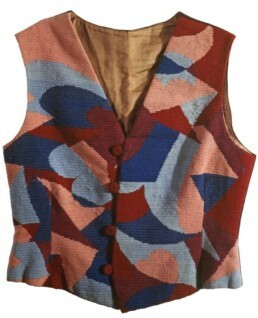 The works of art of the collection, are the most important gathering of futurist art now existing (and is also an extremely complete view of Balla’s art activity in this field), considering the historical pieces of major importance for the european avantguard, as the sketches of the first clothes and futurist fabrics (1913-14). We may find his studies of every type of fashion element and accessorize (jackets, male suits, gowns, ties, shoes, clutches, foulard, scarfs knitwear, gilet, fabrics, embroideries, textile applications, etc. ), as well as artifacts made in that époque (from 1914 al 1930 c.) from the same clothes, ties etc. Another section of major interest is represented by the studies of applied futuristic art, as furniture, tapestries, lampshades, interior design projects, carpets, lamps, ceramics and various objects; Balla’s activity has its origin during the preparation of the Manifesto della ricostruzione futurista dell’universo (1915), which marks a significant moment in history where, the aesthetics shifted from traditional art to all aspects of daily life. Laura Biagiotti with her family created in 1996 the Biagiotti Cigna Foundation in memory of her husband, Gianni Cigna, who prematurely passed away. The collection was originated by a strong passion for art which may be observed in the 200 masterpieces by Giacomo Balla. One of his main sections is based on his studies on fashion representing the most important existing example of applied futurist art. The entire collection has been presented in Moscow in 1996 at the Puskin Museum and in 1998 in Rome at the Chiostro del Bramante. The tapestry Genio Futurista (1925) has been exhibited at the Ara Pacis of Rome in 2009 and at the Italian pavilion for the Expo 2015 in Milan. Significant artworks of the collection have been exposed in the most polular museums of the world as in the Guggenheim in New York, Museè d’Orsay in Paris, Kunstforum in Vienna, the MART Museum of modern and contemporary art of Trento and Rovereto, the Prada Foundation and the Ca’ Corner della Regina in Venice. “Gianni and I felt as if we had met Giacomo Balla. Our Bal-history began in October 1986 when I occasionally arrived, with joyful intuition in a small gallery of art in the center of Rome, where there was an exhibition of Balla’s masterpieces regarding his family. In that occasion, I was struck by futurism and going back home I felt enthusiastic; with my husband Gianni Cigna we decided to buy all the collection exposed. With this first part of the collection, the friendship with Luce and Alice Balla, the artists’ daughters, started to develop. They made us perceive in a tangible way their father, not only as an artistic genius of this century, but also as a gentle soul, enthusiastic poet devoted to his artistic research of light, movement and sentiment. We have bought many artworks but we shall say we have received them in tender custody by the “Balla girls” as we called our beloved two old ladies. 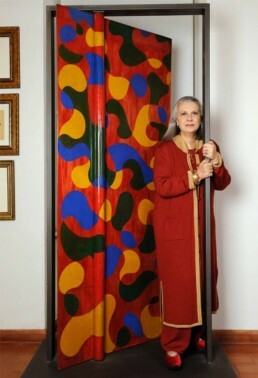 Laura Biagiotti, passionate art collector, is one of the first made in Italy names, which supported the combination of ‘art and fashion’ as an harmonious dialogue in a collection and as a “patronage” of art. She has restored with the contribution of Laura Biagiotti Parfums, the Capidoglio stairs designed by Michelangelo, Piazza Farnese fountain in Rome, the two Dioscuri, and donated New Stage Curtains to the Fenice Theatre in Venice after the terrific fire.